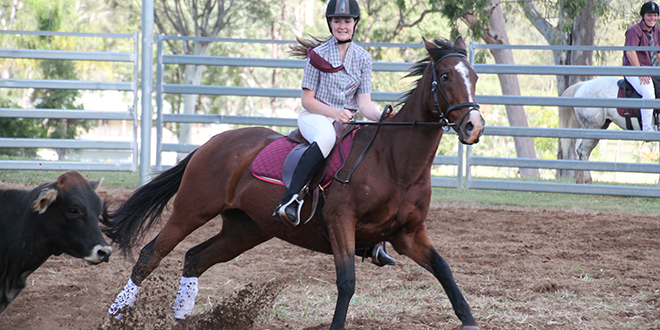 Good times: Bridget Barkle on her horse at the second annual Cow Horse competition at Nanango. WHEN Bridget Barkle jumps on her horse for equestrian competitions, she doesn’t ride to win. The Year 11 student at St Mary’s College, Kingaroy, competed at the second annual Cow Horse competition this year at Nanango. “It’s not all about winning, but having a good time,” Bridget said. Meeting the other 120 student competitors from across 14 South Burnett schools, which includes St Mary’s, is another reason she enjoys the competition. Competitors showed off their best equestrian and cattle-mustering skills in seven events. Fellow competitor and college captain Gabe Crane has been riding since he was a young child, and began competing in competitions in primary school. “It’s part of the routine of my country life,” Gabe said. Principal Michael Nayler said the competition was “a real celebration of country culture”. “It’s about brotherhood and sisterhood, with the country kids coming together,” he said. Mr Nayler said the competition also taught students to have a Franciscan model of stewardship for creation. “The animals are well loved, and is really like St Francis, who talked about looking after animals as a way of honouring God,” he said.